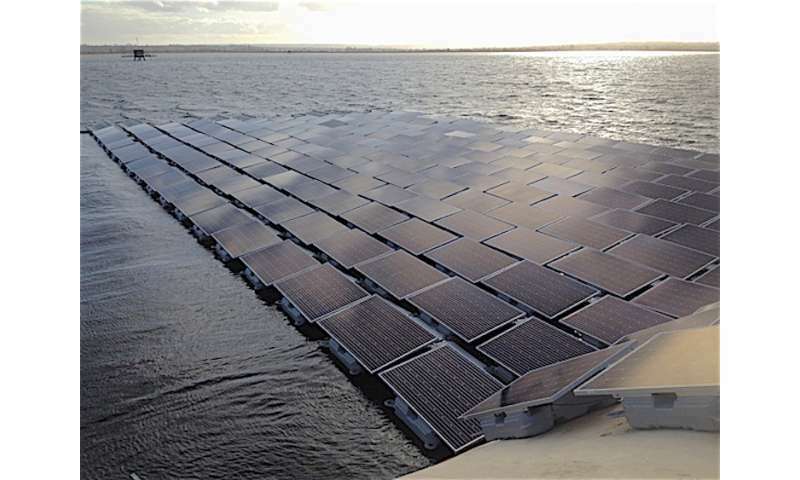 Workers with Ennoviga Solar and Lightsource Renewable Energy are set to unveil the largest floating solar array in the world, later this month. The five year project was commissioned by Thames Water and the electricity produced by the array will go towards powering water treatment plants that support London and surrounding areas. The array has been built on the Queen Elizabeth II reservoir, which sits approximately 20 miles from London, and will have a top capacity of 6.3 MW, able to generate approximately 5.8 million kWh during the first year of its operation. The project is part of a pledge by Thames Water to become a more sustainable business by making its own electricity—their goal is to produce 33 percent of their needs by 2020 (they are currently at 12.5 percent due to operating solar arrays at 41 of their existing sites). The array at the QEII reservoir consists of 23,000 solar photovoltaic panels atop 61,000 floating platforms, which are held in place by 177 anchors—the overall result is an array approximately 128.3 hectares in size (approximately 6 percent of the surface of the reservoir) with a perimeter of 4.3km. Officials with the $8.3 million project have noted that floating arrays have advantages over those on land, one of the most prominent being the constant cooling provided by the water below. Floating arrays are also easier and cheaper to build—individual panels are placed onto their platforms and floated out to the main unit where they are simply attached and anchored, which makes adding additional panels in the future a simple matter. Another advantage is that they use space that is not being used for any other purpose, thus they do not take away from other resources. In the case of the QEII project, the array offers another benefit as well, it shields the water from the sun reducing algae growth. The officials with the project acknowledge that their record breaking effort will soon be overtaken by other projects currently under construction (such as the massive array currently being built in Japan and due to be completed in 2018)—wishing others the best of luck, noting they are proud to be leading the way and hope others will be inspired by what they have created. The report use button does not work.